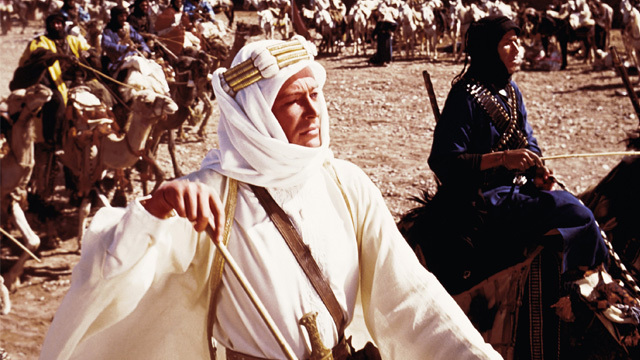 Director David Lean was a maker of intelligent epics about culture clashes and the conflicted characters that mirrored those battles within themselves. 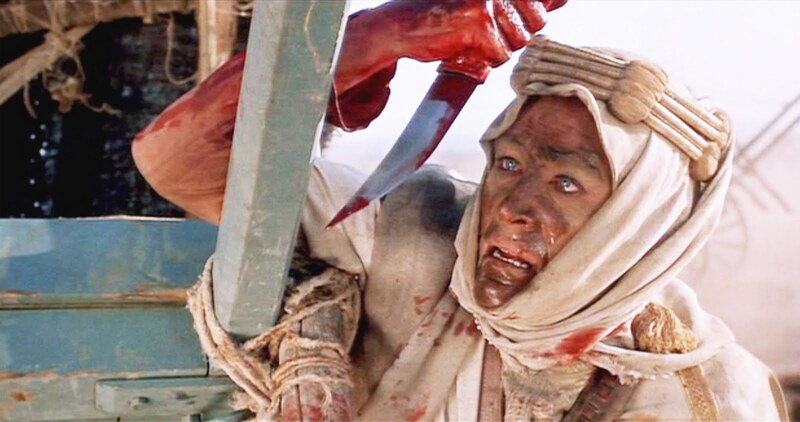 Sometimes the war was within a single country, such as in Doctor Zhivago, and sometimes between very different civilizations, such as in The Bridge on the River Kwai, and in this 1962 Oscar winning film. The movie begins with Lawrence’s death in a motorcycle accident in 1935 in England and his subsequent memorial service. Many people are asked who the man was, which turns out to be a difficult question, since he combined so many often opposing characteristics. One man, the reporter Jackson Bentley (Arthur Kennedy), who covered Lawrence’s exploits, says “he was a poet, a scholar, and a mighty warrior. He was also the most shameless exhibitionist since Barnum and Bailey.” The film explores these different facets. The title of the movie suggests the two worlds which collide in this story. 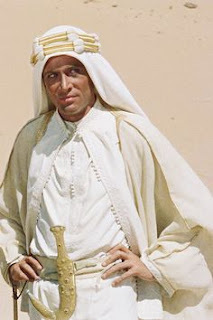 T. E. Lawrence (Peter O’Toole in probably the most impressive film debut ever) is a British officer who assigns himself the task of bringing together the disparate Bedouin tribes to form a united Arabia. 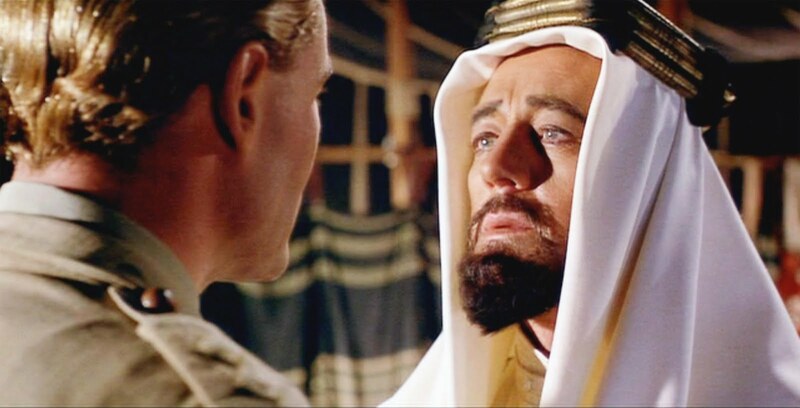 He tries to accomplish this goal during World War I when the British explore the possibility of helping Prince Faisal (Alec Guinness) in his revolt against the Turks. We quickly verify Bentley’s opinion that Lawrence is well-read by his learned references. He also voices a craving for a chance to exhibit his abilities. He receives his opportunity when the military assigns him the task of assessing Prince Faisal’s situation. When Lawrence meets Faisal he says he has allegiance to England and other things, which in this case is the freedom of the Arab people. Faisal questions this split loyalty. He says, “The English have a great hunger for desolate places. 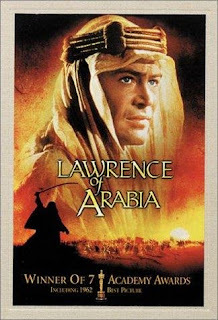 I fear they hunger for Arabia.” Lawrence tells him that he must deny the English his land. So, Lawrence does go rogue when it comes to the British agenda. But, Faisal is an insightful man, and tells Lawrence, “I think you are another of these desert-loving English.” That is why Lawrence doesn’t “go native,” converting to the Arabic way of life. He is an Englishman, and the English have a long history of pursuing imperialism. This predisposition includes a condescension toward the peoples in the colonies, thinking that the rulers are the civilized ones who know what’s best for those they lord over. Lawrence shows this condescending attitude in his superior posturing, even if it is for admirable reasons. 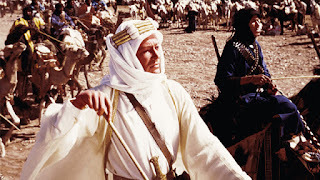 In his first meeting with The Bedouin leader, Sherif Ali (Omar Sharif), he says, “So long as the Arabs fight tribe against tribe, so long will they be a little people, a silly people – greedy, barbarous, and cruel, as you are.” But, his egoism exhibits a private imperialism which goes beyond the influence of his countrymen’s ways. He says that the Arabs should have their freedom, but he patronizingly states, “I am going to give it to them.” He at one point says that he comes from a fat country with fat people, but that, “I’m different.” He reveals his extreme self-centered nature and exhibitionism, and his potential to be a warrior, on several instances. When he lets a burning match singe his fingers, an act he has performed before, he says he is able to do it because the trick is not minding the pain, which he feels he can rise above. He is shot by a Turkish soldier in the arm after leading the Arab tribes in blowing up a Turkish train. When asked if he is hurt, he says not at all: “They can only kill me with a golden bullet.” He says to Ali, “Do you think I am just anybody, Ali? 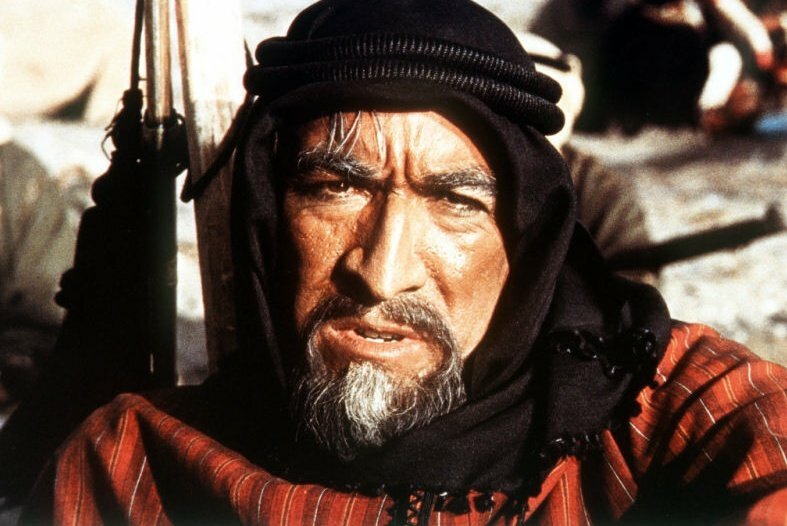 Do you?” And when questioned by another Arab tribal leader, Auda Abi Tayi (Anthony Quinn) about the recklessness of crossing the Sinai desert, Lawrence shows his megalomaniac perception of himself by comparing himself to Moses. (He even isolates himself in the desert, like a biblical hero, purifying his resolve, when deciding his course of action). Auda breaks Bentley’s camera because, as Lawrence says, he believes it will steal the Arab’s soul, which may be a cautionary reference to how the seduction of fame can undermine one’s moral center. But, Lawrence has no problem being photographed, as he strides over the derailed train, above the others, his enlarged shadow literally overshadowing his followers. His hubris can be dangerous, however. He thinks he can infiltrate a Turkish fortified town, despite his blonde, blue-eyed fair-skinned appearance just by wearing Bedouin dirty clothes (more condescension). When going through the city’s streets he says to Ali that there is nothing to worry about because he is “invisible.” This self-delusion of invincibility gets him caught by the men of the sadomasochistic Turkish Bey (José Ferrer), whose persistent cough is symbolic of his diseased nature, and who strips off Lawrence’s upper clothing and fondles him. When Lawrence hits the Bey the latter orders him brutally beaten. This incident so humiliates Lawrence that he no longer considers himself extraordinary, and just wants to be an ordinary soldier. But the British General Allenby (Jack Hawkins) wants to use Lawrence, so he flatters him and brings his egoism to the fore once again. However, his hunger for hero worship blinds Lawrence from recognizing how it can lead to abusive power. He subsequently gives in to his blood-lust when he needlessly goes out of his way to lead his men in the slaughtering of Turks on the way to Damascus. Lawrence’s usefulness is at an end to those who are really in charge. His vision of a united, independent Arabia, a place which he said he loved, is now a fleeting realization. Lawrence rides in a staff car to go back to England. The driver says to Lawrence that the promoted colonel is going “home.” But, Lawrence has no true home now, at odds with his country of birth, and exiled from his land of opportunity. A motorcycle passes the car Lawrence is in, an omen of the nothingness that awaits him. The next film will be The Treasure of the Sierra Madre.